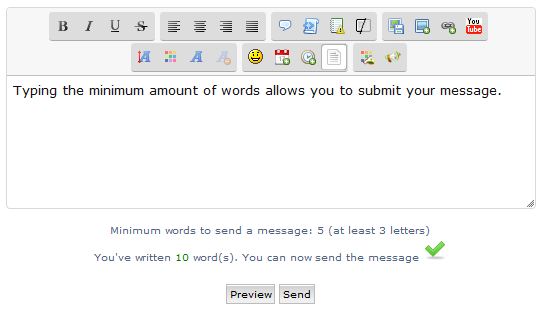 With this tutorial for all forum versions, you will learn how to set a minimum number of words required before the message can be sent. You can also set the number of letters each word must have. is the minimum number of words necessary to post a message. 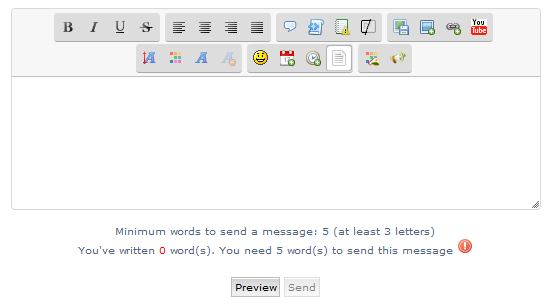 Default is 5.
is the minimum word length. Default is 3.
is the image that appears when you can send the message (the message exceeded the minimum number of words), you can change it by setting the link of the image you want. is the image that appears when you can not send the message (the message has not yet reached the minimum number of words), you can change it by setting the link of the image you want.